I pledge to make room for art in my life. I will create art with words. I will make art with my camera. I will make art with clay and paper and ink and paint and fiber and pencil–even if I only have fifteen minutes! I will explore new modes of art, and I will relish the experience. I will make art with my cello and with my voice, even if it’s out of tune. I vow to make art for its own sake. I will be a “process over product” maker, and I will ignore those internal voices that say my work isn’t good. I will hear the “why bother,” and I will remember that the value of *my* art is in the making, not in anyone’s assessment of the results. I will claim creativity as a core value in my life, and as such, creating will sometimes come first on my to-do list with no guilt attached. I will celebrate art in my community and honor the people around me who create in many forms. I will seek opportunities to see others’ making or displaying art, and I will cherish those experiences with my family. I will say yes when my kids want to paint, sculpt, or draw. I will join them. I will bring art into my home, but more importantly, I will treat the art that is made in my home with the respect it deserves. Picasso said, “Every child is an artist,” and I am a child at heart. I didn’t know if I would blog about my photography class. I’m a little embarrassed. Why would I take a photography class? I don’t want people to think that I think I’m some kind of photographic whiz kid. I have no illusions of being a professional photographer or some kind of artist or anything. I just want to have pretty pictures of my pretty kids–photographs that are good enough to frame on my own walls and maybe pass to a grandparent. Nothing more. Oh…and maybe spruce up my blog a little bit. I marvel at the beautiful things that human hands can create, especially when those things are made with love. Over the weekend, my baby daughter and I had were able to participate in a very special ladies tea. The place was bustling with pretty little girls in their twirly dresses. 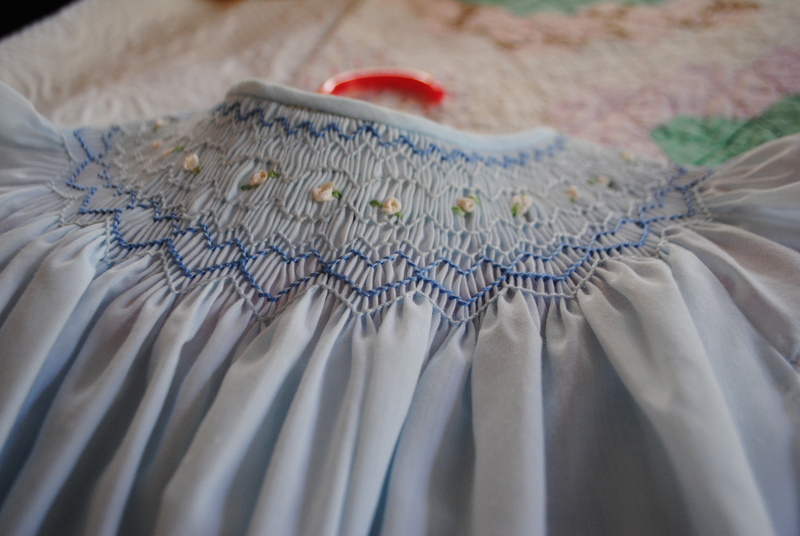 A great many of the dresses were made by a talented woman who hand-stitched the dearest frocks for the girls (daughters, granddaughters, and nieces) in her life. Some of the dresses were around 50 years old! The details were amazing. The fabrics were lovely. The program for the tea was a “fashion show” during which each dress was modeled by a girl and commented upon by the seamstress herself. I was so pleased to be asked to dress Charlotte in one of the amazing creations (although I was terribly nervous about standing up on the stage so that everyone could see the dress.). 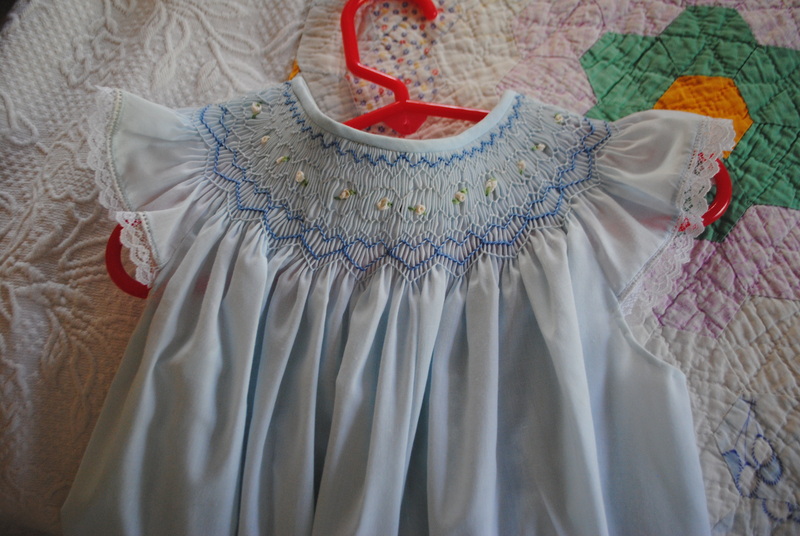 The hand smocking was incredible. 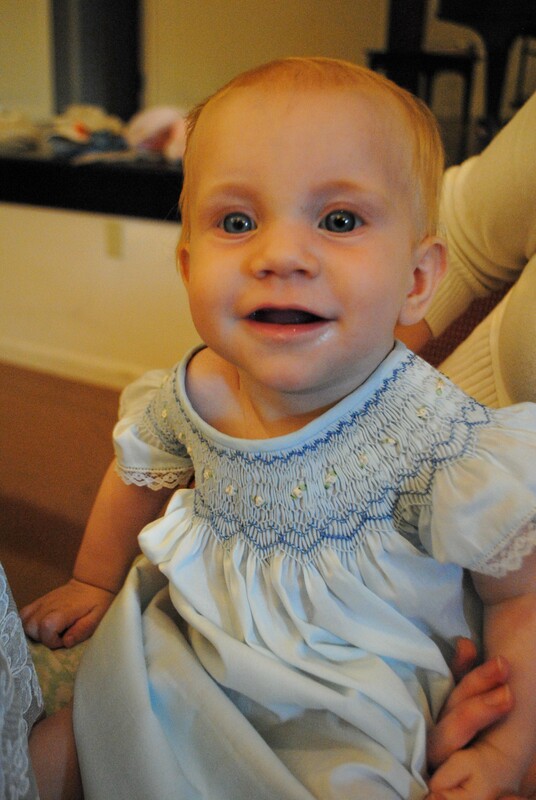 And the color was perfect for my sweet Charlotte’s eyes. I love a new notebook. Have I mentioned this before? 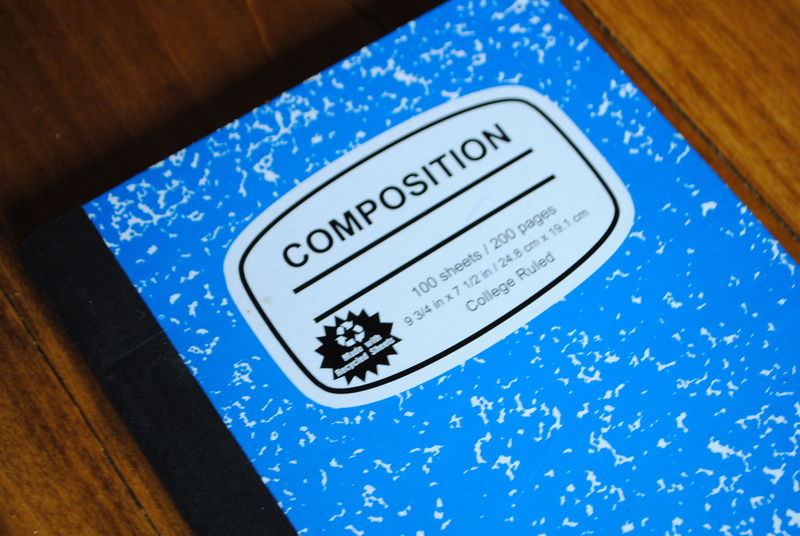 I get really excited–unreasonably excited–by a fresh, clean, untouched notebook. I’ve felt this way for, well, forever. I know I’m not alone in my passion for empty pages. I guess I open a new notebook with the expectation that I will craft the greatest novel of all time or finally perfect the Shakespearean sonnet rhyme-scheme. Or at the very least, I’ll make an awesome to-do list that actually gets done. Imagine. This blue beauty actually belongs to my three-year-old son, and I am proud to say that he is pretty excited about it. We’ve been having writing time after lunch. He makes big, happy swirls on his pages while I’m working on some brainstorming in my hot pink composition book. (Does it get any better than a composition book? Truly?) Some time this summer, I realized something exciting and scary: the itch to write has returned. Now, don’t let me lead you to believe that I stopped enjoying the written work. No, no. But to be honest, seven years later, I am still recovering from MFA burn-out. The tremendous pressure of the whole MFA atmosphere left me to question (again and again) the role I want writing to play in my life. I do not have an answer, but I do know that I want to be more deliberate about including writing in my life–giving it value, giving it time. If my life were a pie chart, the nifty little wedge for “writing” would be just a bit bigger than microscopic…at least lately. It would be bigger than, say, computing statistical proofs, but it would not be as big as doing laundry or picking up socks or changing diapers. Laundry must continue to be done. Diapers certainly need to be changed, but I want writing to show up on the chart. I want to do more than just-about-weekly blogging and more than e-mailing. What role will writing play in my life? If the writing wedge in my hypothetical pie chart grows, which portion will necessarily shrink? Not laundry. I need to think about this, and then I need to do more than think. I need to do. I need to write. Even before I became a mom, I was very curious about the Waldorf tradition of education and child rearing. I’ve read a lot and learned a lot from the internet and books. When son #1 was born, I knew that I wanted to embrace the concepts of seasonal rhythms, creativity, exploration, and natural playthings. Although we are not hard-core Waldorf, we’ve have fun incorporating some of the concepts in our daily life. Yet, we have never had a seasonal playscape. 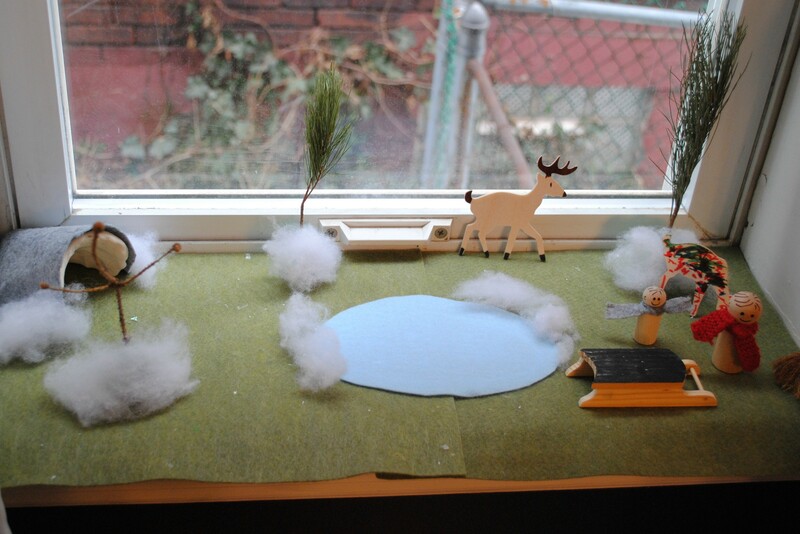 Finally, as part of our Groundhog’s Day fun, the boys and I made a winter playscape. It has been a big hit! 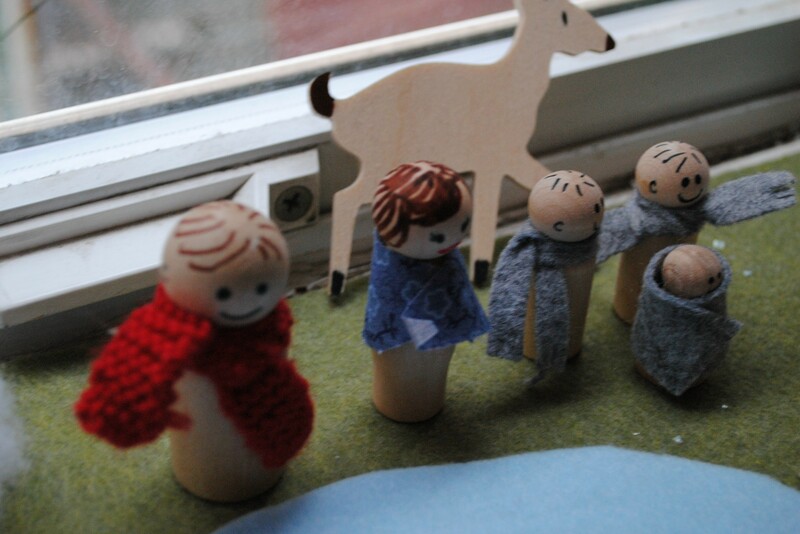 Our little one, in particular, can be found enjoying the little family on our window sill. 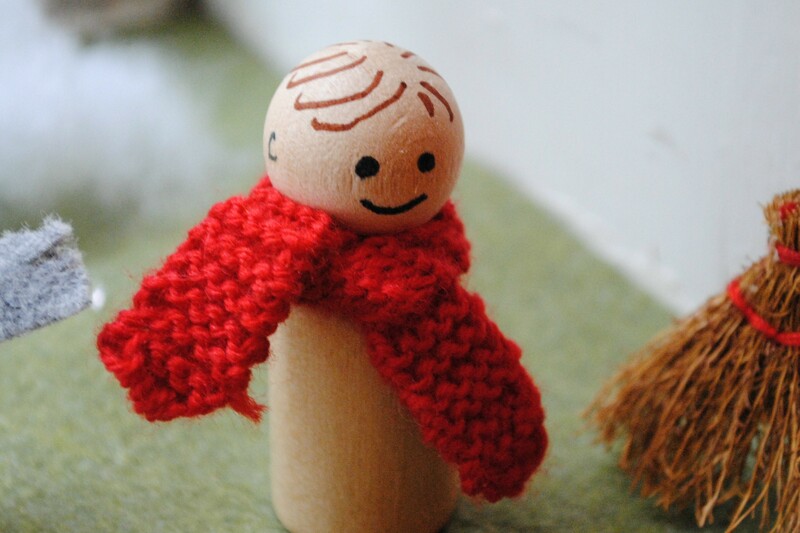 He especially loved “decorating” the poor wooden doe who is now…well…abstract, shall we say. I have been taught–often simply by observation–to value work and effort and creative problem solving. 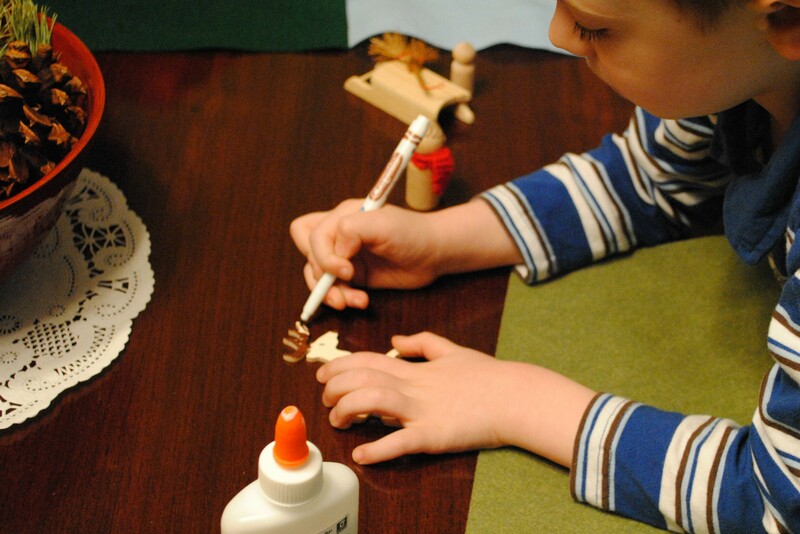 I learned very early on that creating things with my hands and my imagination is fun and rewarding. Even when the cookies burn or the stitches run crooked, I love the sense of play that comes with cooking and crafting and fixing. I especially love sharing these creative pursuits with family members–making cards with Mom (or just admiring hers), reminding my sister how to knit (even though she has decided that sewing is her thing). When I get wrapped up in all the wonderful things that I read on other people’s blogs and I’m feeling all giddy with inspiration, I sometimes forget that this urge to create and discover and build a life of creativity came a long time before I discovered blogging or got a library card to a well-stocked urban library. My mom and dad, along with my grandparents taught me to love doing things myself–sometimes out of necessity, sometimes just for fun. Oh, the stories I can tell! This Christmas demonstrated that the people who love me know what I value and support my efforts even when I fall short of the holiday perfection that I planned. By my calculation, too few of the gifts we gave were homemade, but the gifts I received said, “We know you. We love you. And we know that you can do so many things.” Thank you, precious family. 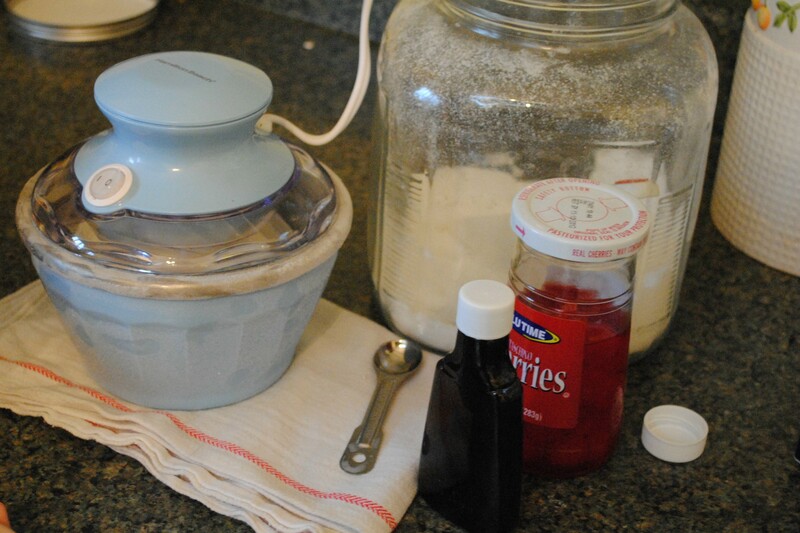 My parents gave us a cute little one-pint ice cream maker. We made dessert on New Years Day! 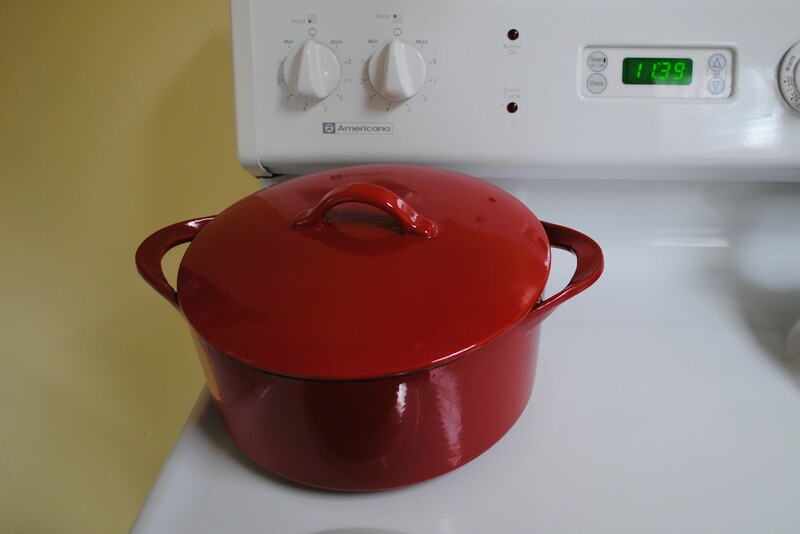 Dad bought me this gorgeous Dutch oven in our extended family gift exchange. I am totally in love! Mom and Dad gave me Artisan Breads Everyday. Can’t wait to get baking. 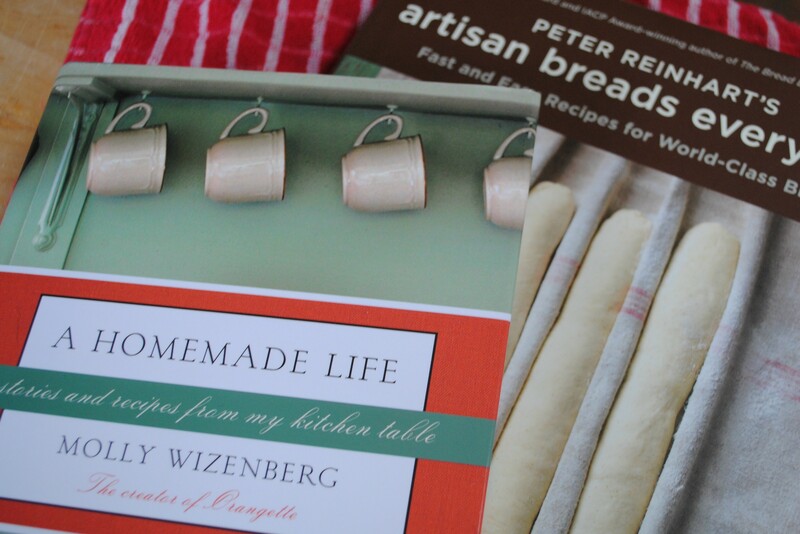 My sister and her hubby gave me Molly Wizenberg’s A Homemade Life: Stories and Recipes from my Kitchen Table. You can learn more about Molly at her wonderful blog, Orangette. I’ve placed her on my Links list to the right. 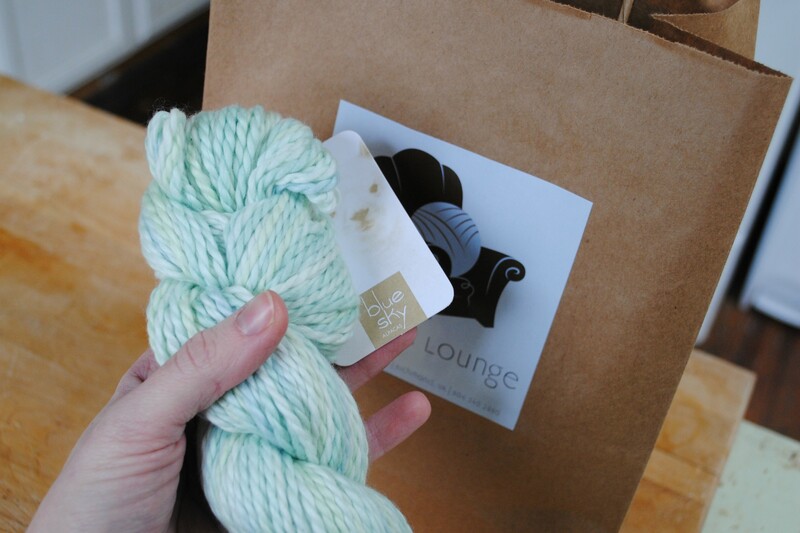 And the yarn. Ah! It’s heavenly. My sister and my brother-in-law gifted me with this sweet, sweet cotton, especially chosen for a dear little summer baby. I’ve been browsing patterns, and I’m looking for just the right tiny something. 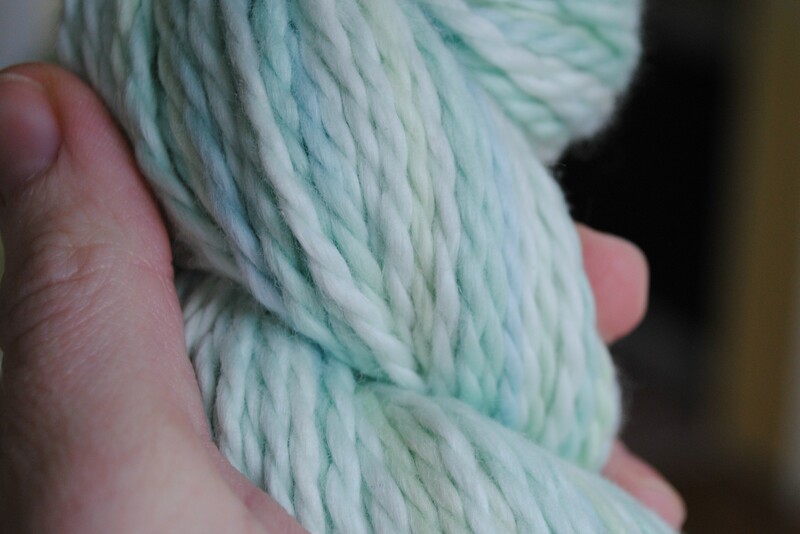 I had trouble capturing the perfect, baby green of this yarn, but these shots come close. Doesn’t it look soft? It is!